Driving into Pueblo Bonito Sunset Beach Resort & Spa feels like arriving at a movie set, except that in this case, the sparkling backdrop of the Pacific Ocean is real. 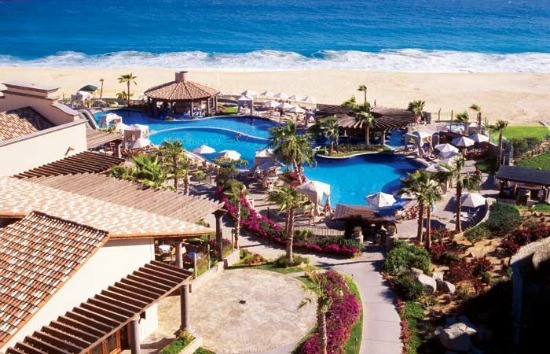 I recently came to this paradise for a quick weekend jaunt at this resort in Los Cabos, Mexico and found a large, luscious all-inclusive resort that accommodates both families and couples looking to unwind and soak up some Mexican sunshine. 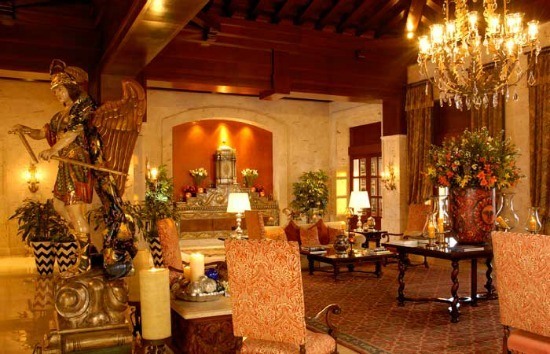 The lobby emits an old hacienda feel with sturdy colonial furniture, trickling fountains and the heady scent of cinnamon wafting through the air. (Just like at Disneyland, scents are pumped in). Carved into the side of a hill, the four diamond property is impressive and vast. A labyrinth of paved golf cart-sized roads snake up the side of the cliff upon which resort villas are perched. This resort hits all of the right buttons with a margarita machine greeting guests at check-in and several pools, seven to be exact. Why so many? Like many resorts in Los Cabos, it’s beach is unswimmable due to the ocean’s strong undertow. Fortunately guests can access the beach at two other Pueblo Bonito properties in Cabo via free shuttles. There’s a separate children’s pool area and a Sunset Beach Kids’ Club for ages 4 to 11, with childcare provided at an extra charge. The kids’ camp is open Tuesday through Sunday, from 10 am to 5 pm. Activities include games, crafts and movies. If your kids don’t fit into that age bracket, babysitting services are available at a hefty hourly rate. 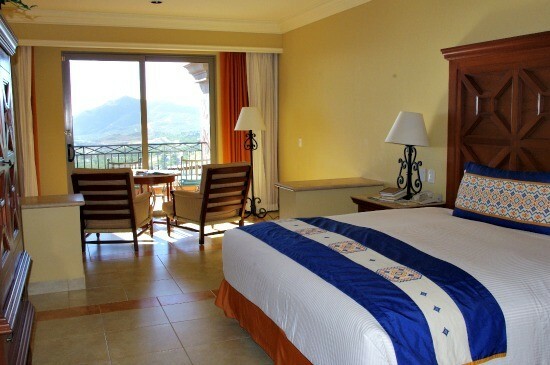 All rooms boast ocean views with a minimum of 435 square feet of living space. In-suite kitchenettes are equipped with a full refrigerator and a two-burner stove. You definitely won’t feel cramped, and the balcony is so large the kids could camp out there. Si, there is high-speed Internet access, but you’re going to have to pay a daily use fee per electronic device, which could add up very quickly. Not all rooms come with bathtubs, and that can be a game changer for families. With a prime position overlooking the Pacific, La Nao is the only buffet on property. It serves up your standard all-inclusive Mexican fare. The Bistro offers a la carte options and is open 24/7 with pizza, pasta, burgers and mommy-size margaritas served in massive goblets. La Frida, the fancy dining room is a real treat. While the some of the other restaurants’ fare is included, you’ll have to tack on an additional fee to dine here; it’s worth it to sample proper gorditas and savory sea bass. Champagne brunch takes place every Sunday at La Nao, but you’ll need to make a reservation if you have any thoughts of attending. There’s also a ton of poolside food service plus other coffee shops and lounges that dispense light snacks. Some of the cafés and coffee shops on site (which do offer free WiFi) are not part of the all-inclusive package. Ask before picking up anything to avoid any unpleasant surprises at check out, like the service fee for room service. I was tipped off to order the fish tacos at the Sky Pool, and they were truly fantastico. Dreaming of a Mexican holiday? 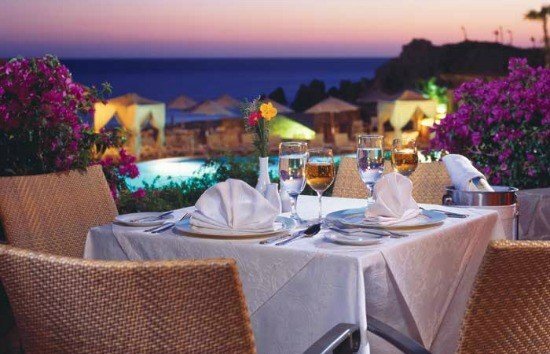 Check out the Pueblo Bonito Sunset Beach Resort & Spa website. 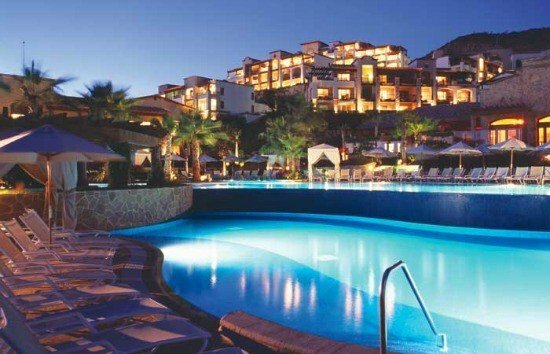 Check back next week for full details about my Los Cabos getaway! What’s your favorite thing about a Mexican vacation: the food, the sun, the sea or the margaritas? Let us know in the comments below! A Note from The Saucy Travel Mama: Thank you to Los Cabos Tourism and Pueblo Bonito Sunset Beach for hosting my stay. As always, my opinions are my own. Thanks, Ellen. All the rooms had great views as far as I could tell. We were not (at all) within walking distance of Cabo San Lucas. It wasn’t along the corridor (between San Lucas and San Jose) either, but past Cabo San Lucas. There were shuttles that took guests to their two other properties in Cabo San Lucas, which were closer to town. If you really wanted to get to town, you’d have to take a taxi. Thanks for your info. We enjoyed the walk into town from the resort we stayed at and the town had some neat stores and restaurants. The pelicans swooped onto the local boats in front of us. Hi Bill. It’s been a few years since I was at this resort. I’m not actually sure how to get a reduction in price. That’s something you’ll have to negotiate with the hotel. If you’re travelling off season though, you have some leverage. My advice: if you don’t have a rental car, I’d go all in. This resort isn’t on the main Cabo/San Jose Corridor. I don’t recall there being many restaurants in the vicinity. Hope this helps! Is this a good resort for tweens & teenagers? Things to do at night? Did you book any excursions?